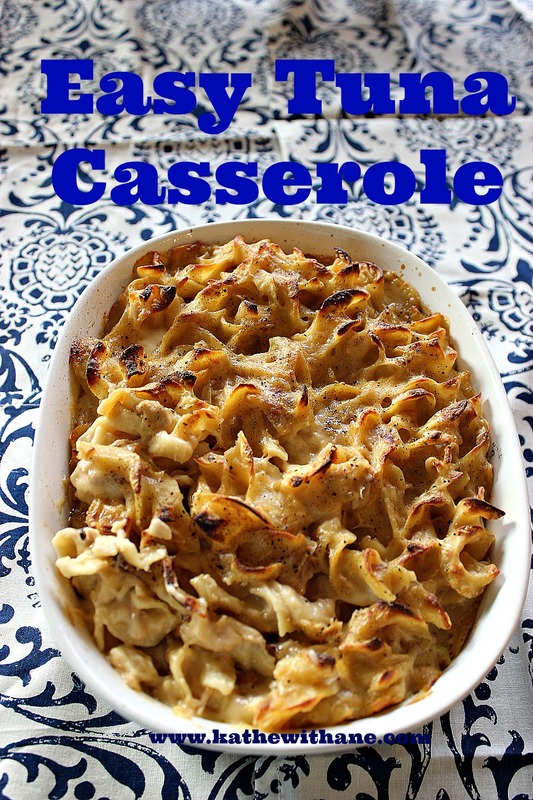 Tuna, egg noodles, milk, flour, cheese and a secret ingredient are all you need to make this easy family favorite tuna casserole. It's great as leftovers, too! During the winter months, besides crockpot meals, I like to make up casseroles. 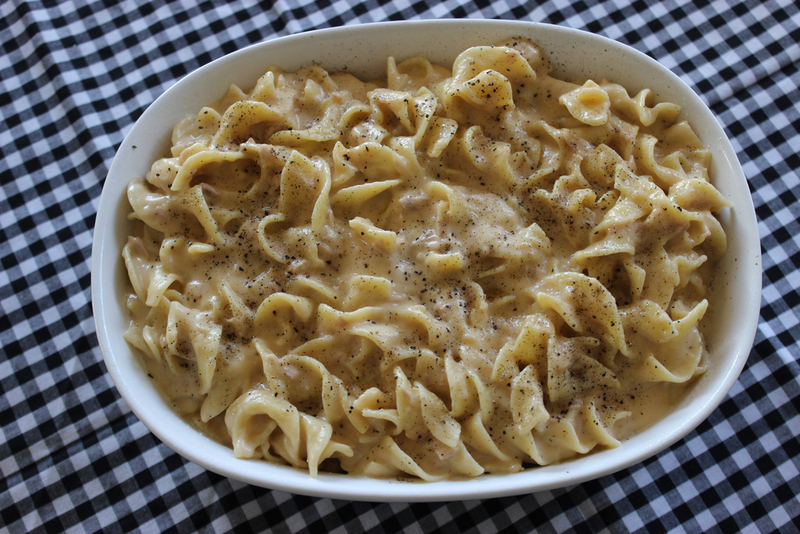 I find them to be one of the best comfort foods and one of my all-time favorites is this easy old fashioned, cheesy tuna casserole that I have been making since my sons were little (so, that is a looong time!). In fact, when we visited with my youngest son and his family last year, I asked him what his favorite meal was growing up and this tuna casserole was it! I asked what it was that he liked the most about it and he said the fact that it was cheesy and how the egg noodles poking out on top got really crispy from baking. I have to admit, that is one of the things I like most about this dish too! Well that and it is so easy to put together. Add a salad or a vegetable and this will be a meal your family will remember over the years too! Spray a 2-quart casserole dish with cooking spray. Preheat oven to 400°F. Cook noodles in a large pot of boiling salted water until al dente, drain. In saucepan, melt butter over medium heat, whisk in flour and continue to whisk for 2-3 minutes. Slowly add milk to roux while whisking, and bring to a gentle boil, allowing the sauce to thicken. Turn off heat and add shredded cheese a handful at a time, whisking each addition until smooth. Stir in the Worcestershire sauce and drained tuna and add salt & pepper to taste. Add egg noodles and transfer to prepared casserole dish. Bake until topping is crisp and sauce is bubbling, 25 to 35 minutes. I love tuna casserole! I am so gonna try this recipe. Thanks for sharing it Kathe. This looks so good. I enjoy tuna casserole very much. I use a mac n cheese box mix, add tuna, cream of mushroom soup, mushrooms and milk. It's good and easy. Yours is fancy! This looks delicious! I love tuna casserole also! 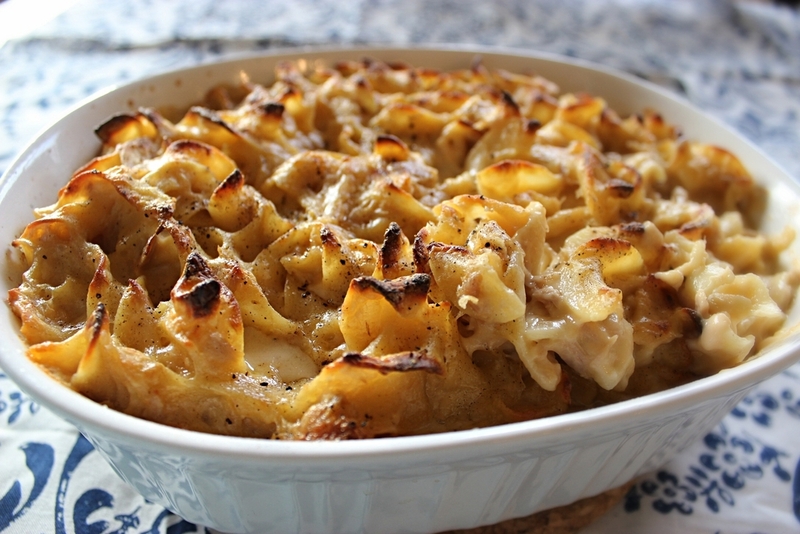 We love tuna casserole, but haven't had it in a very long time. I love the addition of the Worcestershire sauce, I would have never thought to add that. Thanks for linking up with us this week at The Wednesday Showcase! Looks delicious, Kathe. I think this may be on the short list for our future meal planning - Thanks for sharing!